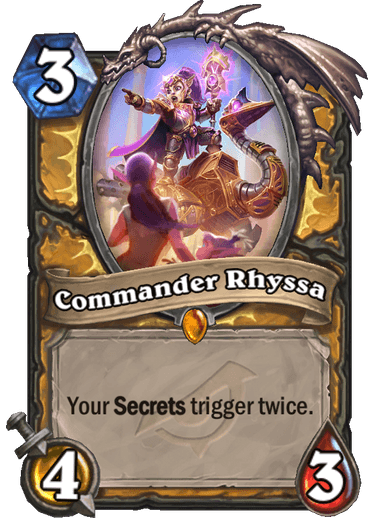 Commander Rhyssa is a 3 Mana Cost Legendary Paladin Minion card from the Rise of Shadows set! You know a better wording for this would be “Your secrets can trigger twice in one turn.” If did that way it could be used for all pally secrets. Except maybe wisdom without facing a combo deck but that secret is rarely played. More suitable for Wild than Standard, as long as Paladin doesn’t get new card draw. Current version of Secret Paladin is getting gutted with cards like Hydrologist, Unidentified Maul, Call to Arms, Fungalmancer, Sunkeeper Tarim and especially Divine Favor rotating out. That said, the new Never Surrender! looks quite strong, and will be insanely strong vs. damage-based removal in combination with this card (RIP my Control Mage). It is so shocking that lately out of nowher epeople in wild started playing secret paladin despite the fact that they all have baku :D. I guess some people felt that their already their almost 1 but not quite tier 2 deck is getting a buff. It shure works well with most of the secrets. I already have 2 secrets in my baku deck who wouldn’t want 2x avenge or 2x competitive spirit. It kind of does not synergizes with defence matrix that much uless it gives another random minion divine shield or penance. So while it synergizes with some of the secrets it leaves 1 or 2 behind that is a bit unfair for these cards that were not designed in mind with this card. I do no think this should exist i think those secrets must get unfair advantages too :P. And i would like to see them a bit more played i love penance. And defence matrix is not half as bad as “get down”. 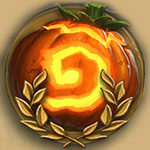 Overall every low cost legendary card is a wellcome addition to the game. 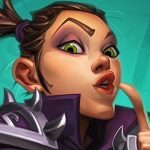 Quite a bit chunk of the legendary cards were designed to cost a lot. And 4/3 is fair for aggro decks. Problem is that cards like kirin tor mage give you better tempo and more value and they are not legendary. And while almost every paladin deck runs a secret or 2 drawing this with them is not that consistent.You have almost no chance to combo them properly and you are left with a simple boddy on the field. And secret pala loses its value from time to time it nevers stays tier one deck, because its secrets are easy to play around and are not that much valueable. Unlike secret mage :D, get that aluneth out of here. This feels kinda fair. Double trigger on Eye for an Eye is pretty neat, but so obvious. Works with EFE, Hidden Wisdom, I THINK it summons 2 2/1s for Noble Sac, and obviously the new secret Never Surrender. Stat line is fine though, and you do get a lot of extra value if you play this with like 3 secrets. Don’t really see this card being great right off the bat, but it definitely can age well. 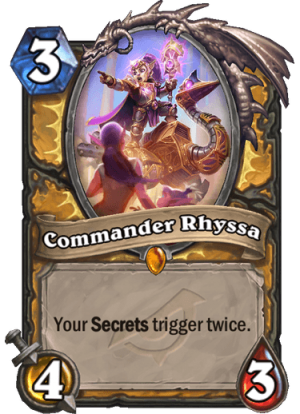 The nice thing is that there are secrets to make dropping Rhyssa failsafe- Noble Sacrifice and Never Surrender cover her from minions and spells respectively, and if all else fails Redemption will summon two copies of her (or distract your opponent into testing for it with your tokens, I guess). A card worth experimentation, clearly. Cant wait for Double noble sacrifice double redemption, I LIVE I LIVE!!! Seems fun in Wild with Avenge and Competitive spirit. Odd Paladin probably wants to run the new secret too. For Standard there’s still Bellringer Sentry, and this curves right into it. Seems okay so far. Secret Paladin would be interested, that’s for sure. You’ve got Subject 9 as well, so you can surely pull off some sort of deck with those 2 and the secrets themselves. 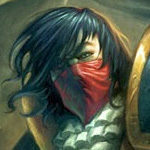 Not sure that she’ll get much play right away, but there will be five more sets to come before she rotates out, each with – one assumes – one new Paladin secret. So if she doesn’t work right away, they’ll probably try to make her good later. In the meantime, it’ll be fun when some RNG card or another manages to give Secret Mage or Secret Hunter a copy of her. Basically this is limited to only certain secret things like Noble sacrifice would be fine auto defence would be pointless since the second trigger would do nothing. I’d say hidden wisdom, redemption, Noble sacrifice, and never surrender would be only ones this works with in standard. Redemption and never surrender would be the big ones. If Secret Paladin remains as a reasonable aggressive-midrange deck for the Paladin class, this will see play in it. Granted, roughly of the Paladin secrets in Standard, Repentance, Autodefense Matrix, and Noble Sacrifice, really aren’t any stronger when triggered Twice. The rest of the Standard secrets, especially No Surrender and Hidden Wisdom, are pretty reasonable though (Assuming Redpetion would return two copies of the minion to the board). Even with that though, Rhyssa will probably be one of the first cards to cut for more budget friendly builds of the deck. at the very least, it won’t be necessary for it to really function. Ok, so autodefense matrix and repentance makes no sense here… but what about redemption? will that make two x/1 copies of the minion? or what if this get killed? will it make 2 copies of this? 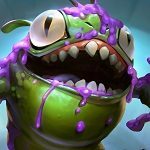 How does it work, say a Repentance would set a played minions health to 1 twice? 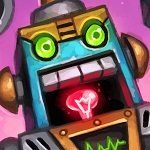 Or Autodefense Matrix would give a friendly minion divine shield twice before it is attacked, or once before and once after it is attacked, and same with other secrets that make no sense to proc twice, or do you just remain another copy of secret active after it procs. Someone please explain, thanks in advance. Some secrets benefit from this Legendary. Some don’t. As simple as that. So it’s a Standard card that is only good in Wild format. Secret Paladin just got good. I like this card. You haters can hate all you want. But this card in my opinion is going to rock n roll. Even if this isn’t all that good of a card, I’m still going to play it. Oh boy, can’t wait for my double Repentance and Autodefense Matrix!